Red-eyed Vireos are among the most common nesters in the deciduous woods at Cedar Creek. 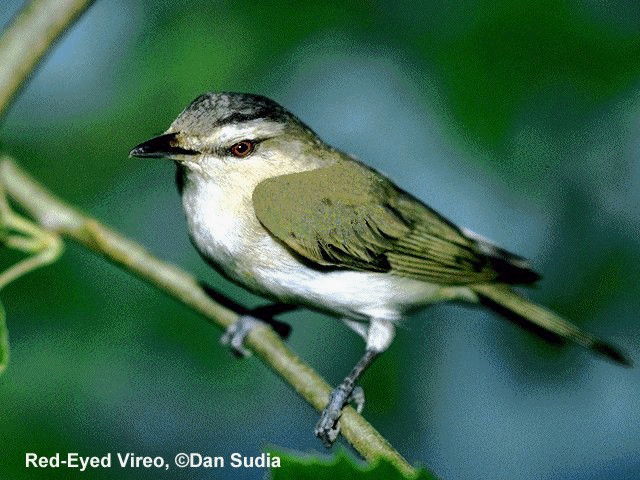 Nationally, Red-eyed Vireo numbers have been on the decline, presumably due to habitat destruction in Latin America. At Cedar Creek, while still common, they do not appear to saturate the suitable habitat, and the resources available could apparently sustain a significantly higher breeding population. Solitary Vireos are fairly common migrants at Cedar Creek. There are no summer records, but it would not be inconceivable that an occasional bird could be found in the northern parts of the CCNHA. Yellow-throated Vireos are fairly common nesters in the drier, partly open woods at Cedar Creek. Nests were found in 1974, 1986, 1989, and 1990. At Cedar Creek Warbling Vireos are chiefly found as breeding birds in aspen clumps, and so have a spotty distribution. They are uncommon elsewhere but are dependable in certain of these aspen groves, such as those north of 76 and those north of 26. Philadephia Vireos are a migrant at Cedar Creek, and apparently uncommon, though because of possible confusion with the other vireos or Tennessee Warblers it is difficult to estimate their abundance.